The New Silk Road, formally termed the Silk Road Economic Belt and also known as the "One Belt, One Road," was first proposed by China's President Xi Jinping during his 2013 visit to Central Asia. This initiative aims to revive the historical vitality of trade and exchanges among Central Asian countries and China.1 The vision of the Economic Belt "[brings] together China, Central Asia, Russia and Europe (the Baltic); linking China with the Persian Gulf and the Mediterranean Sea through Central Asia and the Indian Ocean. "2 In Central Asia, the New Silk Road is designed to pass through Khorgos, Almaty, Bishkek, Dushanbe, Samarkand, and Turkmenistan before reaching Tehran. The New Silk Road is the landmark initiative of China's economic engagement in Central Asia, serving to meet China's economic needs of developing its western provinces such as Xinjiang and gaining access to energy resources in Central Asia. However, China's efforts at engagement are set to compete directly with those of Russia. Central Asia has traditionally belonged to Russia's sphere of influence. Starting from the 2000s, Russia has started to reengage with Central Asia with the goal of playing "a dominant or privileged role" in the region.3 China's increased economic presence in Central Asia may conflict with Russian initiatives to reinstate its prominent regional role, most notably through the Eurasian Economic Union (EEU). As Chinese and Russian engagement in the region continues to intensify, it is inevitable that they will vie for the Central Asian countries' attention and resources. However, interactions between China and Russia in Central Asia are not necessarily zero-sum due to the vast size and potential of the economic market within the RussiaCentral Asia-China triangle. This paper argues that the coexistence of the New Silk Road with the EEU is feasible, and that potential exists for China and Russia's "winwin" cooperation in Central Asia. It provides evidence for this claim through examination of the New Silk Road's bilateral and multilateral cooperation mechanisms, with a focus on the areas of infrastructure and trade, and evaluating China's overall economic and diplomatic strategy toward the region. From its inception, the New Silk Road was a strategic concept to be realized through "bilateral and multilateral cooperation mechanisms," not an initiative driven solely by China.4 The white paper issued jointly by China's National Development and Reform Commission (NDRC), the Ministry of Foreign Affairs, and the Ministry of Commerce, stresses cooperation as the mechanism to achieve strategic goals. It states, "The Belt and Road Initiative is a systematic project, which should be jointly built through consultation to meet the interests of all. "5 More specifically, the white paper mentions several multilateral organizations in which Central Asian countries participate in some form and whose functions align with the strategic vision and objectives of the New Silk Road initiative. The New Silk Road spans across many of the region's countries, providing incredibly enhanced opportunities for trade and cooperation. Energy pipelines, another major component of regional infrastructure development, have been developed primarily through bilateral efforts. China's main pipeline project in Central Asia is the Central Asia-China Gas pipeline. On the basis of bilateral agreements between China and other involved countries, Line A, Line B and Line C have already been completed, running parallel from the Turkmen-Uzbek border through Uzbekistan and Kazakhstan before reaching Xinjiang.12 In September 2013, China signed bilateral agreements with Uzbekistan, Tajikistan, and Kyrgyzstan to commence plans for Line D.
The New Silk Road initiative will deepen China's cooperation with Central Asian countries to improve border control and reduce entry barriers, so that informal trade will be directed into formal channels, and countries will reap tax, customs and security benefits. The Shanghai Cooperation Organization (SCO), a multilateral organization focused on regional security, will also play a greater role in the New Silk Road initiative. Member states of the SCO include China, Russia and four Central Asian states, who are involved in the SCO Business Council and the SCO Interbank Consortium to work on multilateral financial and economic projects. At the SCO Summit in July this year, the Russian and Chinese leaders agreed to consider SCO as "a convenient floor for integrating the implementation of [the New Silk Road and the EEU]. "23 Both countries voiced support for joint infrastructure development and financing development in the region, calling for a common SCO transport system that incorporates and enlarges the volume of existing transport systems such as Russia's Trans-Siberian and Baikal-Amur railways.24 The SCO will facilitate China's economic engagement in Central Asia and advance the goals of the New Silk Road. Although China is entering Russia's traditional sphere of geopolitical influence and deepening its economic presence in Central Asia, Russia's official reactions have been largely mild. One key reason for this is that China offers Russia a substantial piece of its domestic energy market, thus achieving a "win-win" in this area. According to British Petroleum data, Russia produced 12.9 percent of the world's total production of oil in 2013.25 China (including Hong Kong), on the other hand, was responsible for 12.5 percent of world total oil consumption.26 As the world's largest energy consumer and still a fast-growing emerging economy, China seems to have few problems offering energy contracts to both Russia and Central Asian countries. 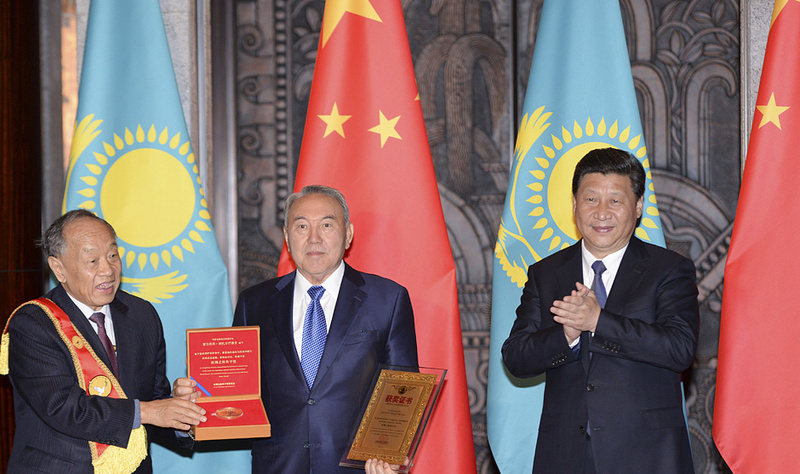 President Nazarbayev and President Xi Jinping, pictured center and right, at a talk before Xi Jinping accepted a peace prize for his New Silk Road vision. Tajikistan needs Russia as a market to export labor.47 At the same time, Tajikistan is worried about limitations on its trade with non-EEU countries and constraints on its foreign policy. Expanding trade with China enables Central Asian countries to balance against Russia's economic power, which also curbs Russia's political leverage on them. This paper has argued that the New Silk Road initiative offers great potential for "winwin" cooperation in Central Asia, between China, Russia and Central Asian countries. For Central Asian countries, an economic relationship with both Russia and China is double insurance. Expanding trade with China enables Central Asian countries to balance against Russia's economic power, which also curbs Russia's political leverage on them.59 According to Nate Schenkkan of Freedom House, Central Asian countries are especially vulnerable to low oil and gas prices, ruble depreciation, remittance income from migrant workers in Russia, and Russian investment and contracts for infrastructure.60 Deeper energy and economic ties with China serve to boost growth when the Russian option is yielding weak results, such as during Russia's current economic crisis beginning in 2014. At the same time, maintaining trade ties with Russia guards against China's potential "economic imperialism,"61 with negative consequences for economic dependency and the environment. Central Asian countries can balance both Russia and China to ameliorate the negative effects of going over completely to one side and cutting ties with the other. China and Russia...must choose whether to compete or cooperate while pursuing their goals in Central Asia. The two countries are courting the same Central Asian countries with a shared aim of regional economic growth. Joint development of infrastructure projects would give Russia access to China's deep investment pockets for improving connectivity in Central Asia, and a joint customs space would cut costs for Chinese goods going to the European Union through the EEU.63 By advancing regional infrastructure development and trade, the New Silk Road may prove a new engine for realizing "win-win" cooperation among all players in the region. Arase, David. "China's Two Silk Roads: Implications for Southeast Asia." ISEAS Perspective 2 (January 2015). Accessed May 3, 2015. http://www.iseas.edu.sg/documents/publication/ISEAS_perspective_2015_02.pdf. Asian Development Bank. "The New Silk Road: Ten Years of the Central Asia Economic Cooperation Program." Accessed April 20, 2015. http://www.adb.org/sites/default/files/publication/29389/new-silk-road.pdf. British Petroleum. "BP Statistical Review of World Energy." Accessed May 9, 2015. https://www.bp.com/content/ dam/bp/pdf/Energy-economics/statistical-review-2014/BP-statistical-review-of-world-energy-2014-full-report.pdf. Bryd, William and Raiser, Martin. "Economic Cooperation in the Wider Central Asia Region." World Bank. Accessed April 20, 2015. http://siteresources.worldbank.org/INTSOUTHASIA/556101-1101747511943/21363080/WiderCAWorkingPaperfinal.pdf. CAREC. Accessed April 15, 2015. http://www.carecprogram.org/. CNPC. "Flow of natural gas from Central Asia." Accessed April 22, 2015. http://www.cnpc.com.cn/en/FlowofnaturalgasfromCentralAsia/FlowofnaturalgasfromCentralAsia2.shtml. Cooley, Alexander. Great Games, Local Rules: The New Great Power Contest in Central Asia. Oxford Scholarship Online: 2012. Dutkiewicz, Piotr, and Sakwa, Richard. Eurasian Integration The View from Within. New York: Routledge, 2015. Eurasian Commission. "Eurasia Economic Integration: Facts and Figures." Accessed May 8, 2015. http://www.eurasiancommission.org/en/Documents/broshura26_ENGL_2014.pdf. Fedorenko, Vladimir. "The New Silk Road Initiative in Central Asia," Rethink Institute, Working paper 10. Accessed May 8, 2015. http://www.rethinkinstitute.org/wp-content/uploads/2013/11/Fedorenko-The-New-Silk-Road.pdf. FMPRC. "President Xi Jinping Delivers Important Speech and Proposes to Build a Silk Road Economic Belt with Central Asian Countries." Accessed April 22, 2015. http://www.fmprc.gov.cn/mfa_eng/topics_665678/xjpfwzysiesgjtfhshzzfh_665686/t1076334.shtml. Kucera, Joshua. "China's relations in the Asia-Pacific: Central Asia." The Diplomat, February 2011. Accessed April 23, 2015. http://thediplomat.com/2011/02/central-asia/. Nakano, Jane and Chow, Edward C. "Russia-China Natural Gas Agreement Crosses the Finish Line." CSIS, May 28, 2014. Accessed May 8, 2015. http://csis.org/publication/russia-china-natural-gas-agreement-crosses-finishline. Olimova, Saodat. "Tajikistan's Prospects of Joining the Eurasian Economic Union." Russia Analytical Digest 165 (March 17 2015): 13-16. Peyrouse, Sebastien. "Impact of the Economic Crisis in Russia on Central Asia." Russia Analytical Digest 165 (March 17 2015): 3-6. Rickleton, Chris. "Turkmenistan: Seeking New Markets to Check Dependency on China." Eurasianet, November 6, 2014. Accessed May 6, 2015. http://www.eurasianet.org/node/70801. Scobell, Andrew, Ratner, Ely, and Beckley, Michael. "China's Strategy Toward South and Central Asia: An Empty Fortress." Rand Corporation, 2014. Accessed May 9, 2015. http://www.rand.org/content/dam/rand/pubs/research_reports/RR500/RR525/RAND_RR525.pdf. Starr, Frederick S., and Cornell, Svante E., eds. Putin's Grand Strategy: The Eurasian Union and Its Discontents. Central Asia Caucasus Institute and Silk Road Studies Program: 2007. Accessed April 25, 2015. http://www.silkroadstudies.org/publications/silkroad-papers-and-monographs/item/13053-putins-grand-strategy-the-eurasianunionand-its-discontents.html. Tarr, David G. "The Eurasian Economic Union among Russia, Belarus, Kazakhstan, Armenia and the Kyrgyz Republic: Can it succeed where its predecessor failed?," The Graduate Program in Economic Development, Vanderbilt University, September 29, 2015. Accessed November 4, 2015. http://as.vanderbilt.edu/gped/documents/DavidTarrEurasianCustomsUnion-prospectsSept282015.pdf. Tass Russian News Agency. "Putin and Xi Jinping discuss projects to combine the Silk Road economic belt with EEU." Tass Russian News Agency, July 8, 2015. Accessed October 24, 2015. http://tass.ru/en/economy/806984. The BRICS Post. "China's Silk Road wins big at SCO Summit," The BRICS Post, July 11, 2015. Accessed October 24, 2015. http://thebricspost.com/chinas-silk-road-wins-big-at-sco-summit/#.Vi6mpGSrQy4. The National Development and Reform Commission (NDRC). "Vision and Actions on Jointly Building Silk Road Economic Belt and 21st-Century Maritime Silk Road." Accessed April 20, 2015. http://en.ndrc.gov.cn/newsrelease/201503/t20150330_669367.html. Tian, Shaohui, ed. "China, Russia agree to integrate Belt initiative with EAEU construction," Xinhua News Agency, May 9, 2015. Accessed May 9, 2015. http://news.xinhuanet.com/english/2015-05/09/c_134222936.htm. U.S. Department of State. "Investment Climate Statements 2014: Kyrgyz Republic." Accessed May 9, 2015. http://www.state.gov/e/eb/rls/othr/ics/2014/index.htm. Note: this quote is also attributed to New Zealand physicist Sir Ernest Rutherford. "China, Russia agree to integrate Belt initiative with EAEU construction"
Public Domain Xizhuxi.jpg 2014 [Public Domain (https://commons.wikimedia.org/wiki/File:Xizhuxi.jpg)], via Wikimedia Commons. By Canuckguy (JCRules derivative) Eurasian Economic Union.svg 2014[Public Domain (https://commons.wikimedia.org/wiki/File:Eurasian_Economic_Union.svg)], via Wikimedia Commons.